From the Chicago Tribune: Iowa Gov. Kim Reynolds on Friday signed a law banning most abortions if a fetal heartbeat can be detected, or at around six weeks of pregnancy, marking the strictest abortion regulation in the nation — but setting the state up for a lengthy court fight....The ban, set to take effect on July 1, has propelled Iowa to the front of a push among conservative statehouses jockeying to enact restrictive regulations on the medical procedure. Mississippi passed a law earlier this year banning abortions after 15 weeks of pregnancy, but it's on hold after a court challenge. ...Backers of the so-called heartbeat bill — which didn't get a single Democratic vote in the Legislature during final passage — expressed hope it could challenge Roe vs. Wade, the landmark 1973 U.S. Supreme Court ruling that established women have a right to terminate pregnancies until a fetus is viable. Conservatives say an influx of right-leaning judicial appointments under President Donald Trump could make it a possibility. From the Associated Press: DES MOINES, IOWA -- Iowa Gov. Kim Reynolds on Friday signed a law banning most abortions if a fetal heartbeat can be detected, or at around six weeks of pregnancy, marking the strictest abortion regulation in the nation — but setting the state up for a lengthy court fight... Reynolds acknowledged that the new law would likely face litigation that could put it on hold, but said: "This is bigger than just a law, this is about life, and I'm not going to back down." Reynolds signed the law surrounded by children from a local Christian school and children related to supporters. Maggie DeWitte, who leads the group Iowans for Life, called Reynolds' move "historic" and added: "She is following through on her pledge to the people of Iowa that she is 100 percent pro-life." 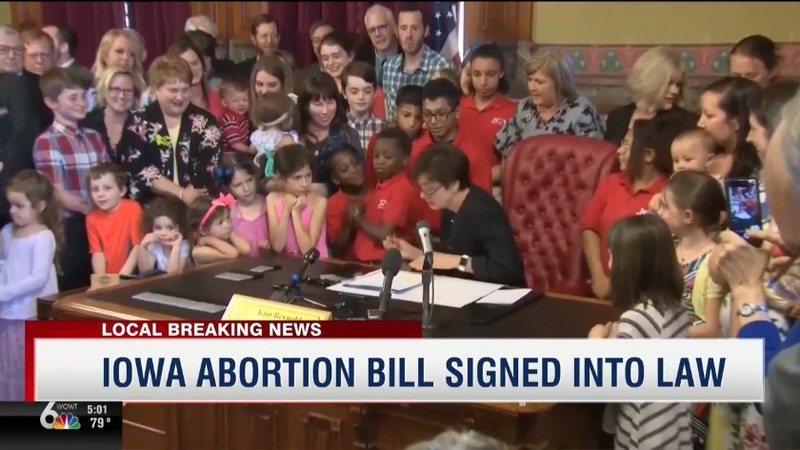 The bill signing came shortly after the Iowa affiliates of Planned Parenthood and the American Civil Liberties Union warned that they would sue the governor if she signed the bill, which the Republican-controlled Legislature approved during after-hours votes earlier in the week. From DesMoinesRegister: As Reynolds inked the bill, backers' cheers nearly drowned out the echoing chorus of “My body, my choice” shouted by protesters just outside the door. Under the legislation, physicians will be barred from performing most abortions after a fetal heartbeat is detected. Experts said that heartbeat can be heard about six weeks into a pregnancy — often before a woman realizes she’s pregnant. COMMENT: Listen to them scream for the blood of babies. For this mob, a baby of six weeks is just a bit of tissue that can be vacuumed out and disposed of. For people who are demanding the right to kill even partially-born babies, this is unthinkable. I wonder what it’s like to be them. How does it feel to be standing in the street, demanding the blood of babies—even those in the process of being born? To sit and watch baby take that first breath, still connected to her mother by the umbilical cord, doctors and nurses standing by. But instead of receiving the baby, cutting the cord, giving her that first tiny diaper, wrapping her up in a blanket, putting a little hat on her head…. they stab the baby in the back of the head, pull her from mother’s womb, and drop her into a stainless steel basin. Pro-death barbarians want that—are demanding that — so, yes, banning the murder of a baby at six weeks for them must seem positively inhuman. Pray for Governor Kim Reynolds, as the demons will be all over her now. Is any politician in America able to stand up against Hell? We're going to find out, I guess. May God watch over and protect the most courageous governor in America.